For those looking for a longer trip, Killarney Provincial Park has a few excellent options. The areas on Georgian around the park offer endless islands and bays to explore, but with the hazards of big winds and waves. If you’re looking to stay on the calmer, scenic lakes within the park, longer trips are also possible, but will include a lot of portaging. This route can last between 6 and 8 days, depending on your pace, and reaches just about all of the sites Killarney has to offer. If you have the time to climb the Silver Peak mountain off of Bell Lake, I recommend taking the hike as well. 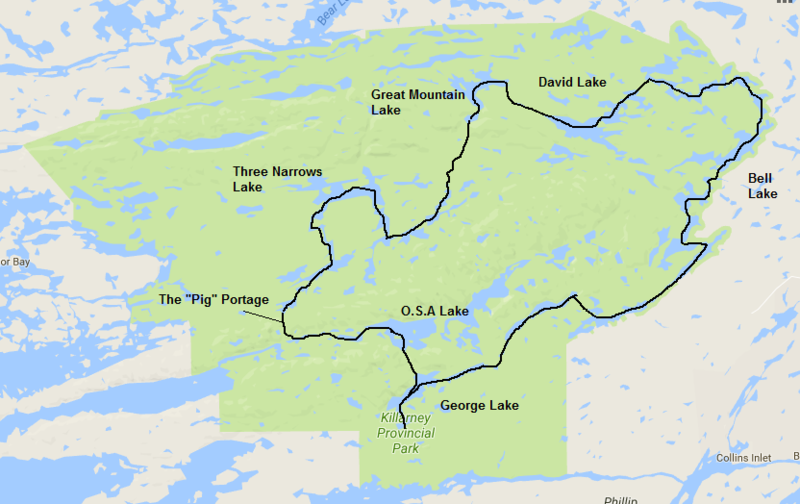 Starting at George Lake, travel in a large counter-clockwise circle, hitting Bell Lake, David Lake, Great Mountain Lake, and Three Narrows Lake, cross the “pig” portage, and then head to O.S.A Lake, and then back through the unofficial portage to George Lake. Highlights: If you’ve ever wanted to do a long canoe trip, and are not afraid of portages, this is a good one. The scenery in my own opinion is some of the best in Ontario, and Killarney is far enough removed from Toronto that you do not get the same levels of “traffic” as you would in Algonquin. The lakes are crystal clear and quiet, and the quartzite hills are absolutely stunning. Downsides: This route comes with quite a few portages. The longest one is a staggering 2.7km, but there are a few others that are in and around the 1km mark as well. My least favorite is the “pig” portage which climbs a large hill and can be slippery when wet. Running the route counter-clockwise makes the “pig” slightly easier, but it’s still a tough trek. If you are planning this route, avoid bug season!